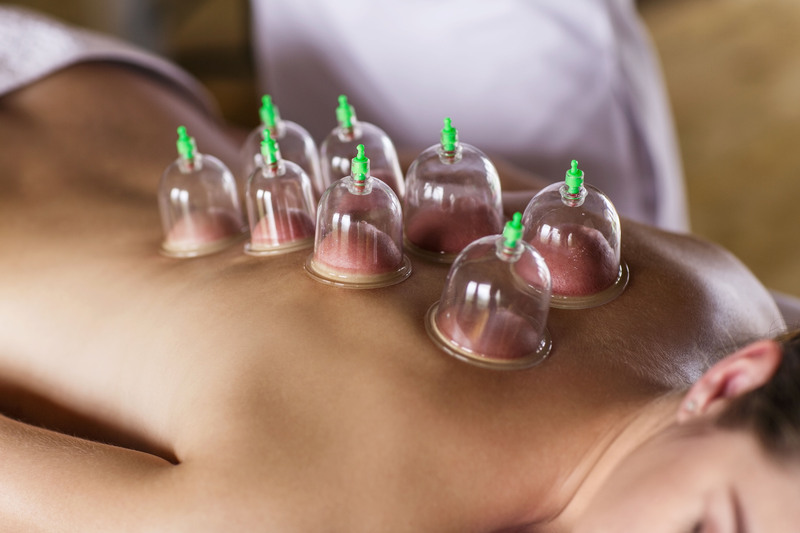 There are three basic variations of cupping. One is dry cupping, one is fire cupping, and the other wet cupping, but all have common aspects. Cupping is where a therapist places special cups or jars (which can be made of glass, earthenware, bamboo or silicone) on the skin to form a vacuum/suction effect. This is done to promote blood flow, relaxation, to reduce pain and inflammation, and also in some cases as a form of deep-tissue massage. To create the suction effect in fire cupping, the practitioner puts a flammable substance such as alcohol or herbs into a cup and lights it. When the fire goes out the cup is put rim-down on the skin, whereon the air inside it cools; creating a vacuum and drawing the skin to be sucked upwards into the cup. The cups are left on the skin for a few minutes. The big difference between dry, fire, and wet cupping is that in wet cupping, the practitioner will remove the cup after three minutes, use a small scalpel to make a series of light cuts on the skin, and then puts a suction cup back over the cuts in order to draw out a small quantity of blood. The involvement of blood-letting and fire might lead you to ask if cupping is safe. Despite how it may look, most experts agree that cupping is safe, and its side effects tend to be only things such as skin discolouration or bruising. So, it is safe, but could it be effective? Some research has been conducted into the safety and efficacy of cupping when conducted as a migraine treatment. A study consisting of 85 patients was carried out between 2014 and 2016. All of the patients were diagnosed with migraines, and all were given three sessions of wet cupping. Questionnaires were given before the cupping sessions began, and again three months after the final session. The study, though small, did conclude that wet cupping was effective in relieving the migraineurs pain. There was also another study, this time from 2008, which found that wet cupping treatment could reduce the number of migraine days in its patients by the equivalent of 12.6 days per month. As usual with migraine treatments, and in particular those migraine treatments which are alternative therapies, the efficacy of them is hard to prove and opinions on whether cupping is a good method for reducing migraine pain remains divided. This was posted in General news, Migraine treatment and tagged Cupping, migraine, Safe, treatment. Bookmark the permalink.